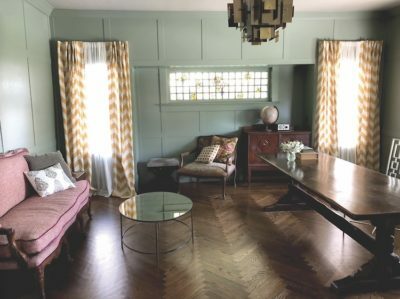 SITTING ROOM is updated with herringbone wood floors and wall paneling painted in a Farrow & Ball accent color. Designing your dream home is never easy or fast, but for one Windsor Square resident, the finish line is finally near. The journey all began when Christine and her husband, Michael, who works in commercial real estate, decided to relocate to Los Angeles from Toronto. When they arrived, their first task was to find a neighborhood to call home. “We started by looking at neighborhoods with good schools,” says Speer. “We wanted to live in a walkable community.” Windsor Square checks both boxes, of course, but there wasn’t anything on the market at the time that grabbed their attention. “We looked at a lot of places,” gushed Christine. KITCHEN was modernized by removing a wall to the family room and adding sliding glass doors. Decorative tiles and white cabinetry help to brighten the family’s main living space. When the couple toured a five-bedroom, 4,000 square-foot property on the 300 block of S. Irving, Christine says their first reaction was: “No way!” The house had recently endured a below-par flip, resulting in a lot of the original details being stripped, and on top of that, the property still needed a lot of work to restore its original glory. A couple of weeks later, however, the property’s seller reduced the listing price and signaled a motivation to sell, which caught the Speers’ attention. Could they buy the property and then design their dream house? They decided to go for it. After hiring a general contractor, the work began in Oct. 2015. The repair list was long, including the hardwood flooring and a chimney that needed to be rebuilt, among other things. The most painful part of the process, according to Christine, was getting a power upgrade to the property. In Windsor Square, power lines are laid underground — a major draw for buyers — but that also means homeowners are responsible for repairs and upgrades. The Speers were told by the city that they had to install a new conduit on their property just to get an upgrade in power. “At one point, we were ready to move in, but were still waiting to get the power sorted out. When it finally got fixed, we moved in that same day.” That was in 2016. BACKYARD was updated with a pool and privacy fence. Once the structural changes were complete, the power restored, and the family in residence, the interior decorating began. 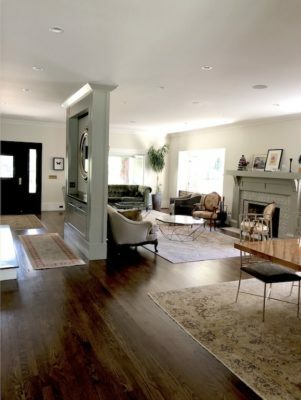 From the start, Christine says it was important for them to design a house that restored original Craftsman details while modernizing the kitchen and family room. “We tried to keep the moldings true to a Craftsman, and we even restored wood paneling in areas,” says Speers. 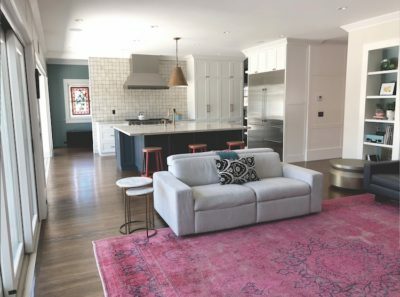 Describing the interior as “eclectic,” Christine says that she wanted an open-concept kitchen and living room so the family could use the space together. With three school-aged kids, a backyard pool was also a necessity of sorts. “Everything was focused on the ability for us to have movie night and hang out together,” says Christine. When it came time to pick paint colors, Christine says she turned to specialist Farrow & Ball, who sent out a consultant to suggest a cohesive color scheme for the house. “It’s really helpful,” she says of the service. “For like $200, they send out a designer. The paint is super-saturated and shifts in different light; it’s moody and neat,” says Speer. Other local vendors that Speer’s credits are Absolute Appliance (“incredible customer service and pricing”) and INFO Lighting (“really nice light store with great service”), both located on La Brea Avenue. FRONT ROOMS are bright and airy. So after years of suffering construction workers, city permits, designers and landscapers, one can’t help but wonder: would you do it all over again? “Looking back, I’m not big on regrets,” says Christine. “The house is designed by us, for us. But had we realized how much work it was going to be, we probably wouldn’t have done it,” she admits. That being said, the Speers plan to enjoy their home for many years to come. “We’re not moving, we’re staying right here,” she concludes with a laugh.